Kain Colter's college career is over, but he could play a huge role in shaping the future of college football. The NCAA is a dead man walking. We can debate when exactly the NCAA as it’s presently constructed will give up the ghost, but the organization that has spent our lives arguing that athletes are students engaged in amateur competitions is finished. Today came the latest nail to be driven into the NCAA’s amateurism coffin: The National Labor Relations Board (NLRB) determined that Northwestern football players were employees of the university, hence eligible to register as a union. While the Northwestern players say their immediate goal isn’t to push for payment, that’s coming (Ramogi Huma, who’s leading the players, told FOXSports.com how that might happen). After all, how many employees in America work for less than their maximum union market value? The NLRB’s regional director determined that, contrary to the arguments of the university, Northwestern football players were employees. The NLRB decision was four-fold, finding that Northwestern’s football players were not primarily students; their labors as football players did not connect to their studies; academic faculty didn’t sponsor athletic endeavors; and that their scholarships were for football not academics. As a result, Northwestern football players were employees, not student-athletes. The NCAA, not surpisingly, strongly disagrees with the NLRB’s decision, saying in a statement: "We strongly disagree with the notion that student-athletes are employees. We frequently hear from student-athletes, across all sports, that they participate to enhance their overall college experience and for the love of their sport, not to be paid." I look forward to Nick Saban announcing he coaches for the overall love of the sport, not to be paid. 1. So what’s the actual impact here? The impact of the ruling is limited to students who attend private institutions and are, henceforth, subject to the NLRB if they also seek to unionize. Public school athletes would be governed by state law, which, given that 24 states, including most of the South, are right-to-work jurisdictions, means that the vast majority of major college football teams could not unionize as Northwestern has. The Southeastern Conference, for instance, has just one private institution among its 14 schools. Kain Colter, players rep take labor case to D.C.
Every SEC school is in a right-to-work state except Missouri. So is every Big 12 school except for West Virginia, and every Southern school in the ACC is in a right-to-work state. Athletes in these jurisdictions would have to comply with state labor law in order to be considered employees. That state labor law is not pro-union, making it more difficult for players on most of these teams to be classified as employees. But — and this is key — if this ruling is upheld and Northwestern’s players are able to seek better benefits, it won’t be possible for only Northwestern football players to receive them; all will have to match what Northwestern gives to its players. So while the end result may be that most players can’t follow the same path to unionization as the Northwestern players, they’re really advocating on behalf of all football players. Whatever Northwestern players get above the current benefits, will likely be received by everyone who plays college football. Unless, that is (and boy would this be a delicious irony), you think other schools are going to let Northwestern pay players more than anyone else. 2. How long will it take for final resolution of this Northwestern case to determine whether football players are employees under the NLRB? It’s hard to know, exactly. The decision will be appealed and the NCAA will fight the employee designation until there are no more appeals to be considered. Much like the Ed O’Bannon likeness suit, which has now been pending for five years, it’s unlikely that any current member of Northwestern’s football team will still be playing when this case is finally resolved. This is a process, not an end result. 3. How does this decision impact Title IX? The easy answer is — no one knows. Theoretically every scholarship team at Northwestern could now unionize, since they would presumably also meet the employee criteria that the football team met. But only scholarship athletes would be eligible to unionize under this ruling. (It specifically exempts walk-on players and the like since they aren’t receiving any remuneration from the university for their labors). So what about all the players with partial scholarships on a variety of different teams? That’s complicated. The easy answer is that right now if you’re a Northwestern athlete under a full scholarship to play a sport, you and your teammates would probably be considered employees and you could form a union. But what about the difference in the value of those employees and their respective unions? The Northwestern men’s football union is creating greater value than, say, the Northwestern women’s swim team union would. So would it be legally permissible for the Northwestern football team to collectively bargain for better payment for their services than the women’s swim team receives? Title IX specifically forbids this from happening — all scholarships have to be equal between the sexes. So what’s the legal outcome here if we end up with disparate treatment of team unions based upon their respective market values? I have no idea. Remember, effectively it’s the profits from men’s football and basketball that funds all the other athletic scholarships at schools. If Northwestern’s women’s swim team unionized, they might discover that they’re actually worth much less than they receive now. 4. Is the term ‘student-athlete’ legally untenable based upon this ruling? Yes, what this opinion basically says is that Northwestern’s football players are at school to play football. They are athlete employees who happen to be students, not vice versa. That’s why this is such a hit to the NCAA — it effectively undermines the entire foundation upon which their organization is built. If these athletes are employees, then the scholarship is not a fair trade and there’s no definite connection between their labor and the scholarship. What this opinion really opens the door to is the school simply employing athletes, whether or not they go to school. After all, most people who work in Northwestern’s hospital aren’t students either, right? This ruling cuts in half the student and athlete relationship. 5. If they’re employees, are Northwestern’s players subject to taxation on the value of their scholarships? Believe it or not, tax experts differ. That, my friend, is not a phrase you want to hear when you’re filling out your taxes. Expect for the NCAA to make a big deal out of this, arguing that players could end up with a worse deal than they receive now. 6. Does this impact the NFL or the NBA draft eligibility rules in any way? Although it’s really the NFL and NBA that have benefited the most from our current collegiate model of athletics. Unlike, say, baseball or hockey, which conduct drafts of 18-year-olds and then create a minor-league hockey or baseball system to develop young talent, the NBA and NFL have allowed college teams to become their free minor leagues. Rather than take risks on developing 18-year-old players, NFL and NBA teams allow the colleges to develop and train the players and then make the best of these players draft eligible starting either three years after they graduate high school in the NFL or one year after they graduate high school in the NBA. None of that changes with this ruling. All this ruling does is make it clear, if you needed any further evidence, that in order to survive the NCAA is going to have to substantially change its governance structure. The days of top athletes only being compensated by the a college scholarship are rapidly dwindling. In fact, according to this ruling, the phrase student-athlete doesn’t exist. 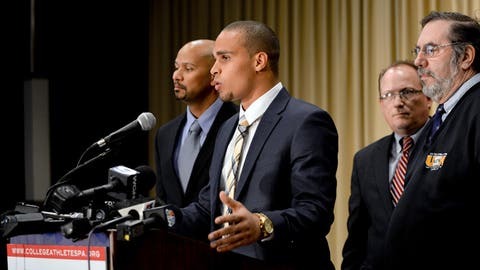 Northwestern football players are employees working for an employer.